Cape Coral is the one of the largest cities in the state of Florida. Residential properties within this beautiful city are mostly well kept. 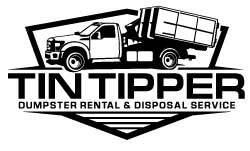 Our job here at Tin Tipper Dumpster Rental is to ensure that we leave your property in the same state we found it. Our Cape Coral based dumpster rental company is owner / operated. This husband and wife team takes great pride in ensuring that you are taken care. We have delivered dumpsters to properties throughout the city, this neighborhoods have included the yacht club area, cape harbor, burnt store marina, Sandoval, and many more. Our truck are designed to fit in your driveway. Our new fleet of truck will ensure that no fluids or leaks stain your residential driveway. The truck also assist Tin Tipper Kevin in placing your bin exactly where you want it on your property. Our dumpsters are designed and manufactured to minimize any residential property damage for your Cape Coral home. The bin is the size of a large van, this means that we can drop off our container the side of your driveway. This will leave room for your vehicles. Since our dumpsters have a rental period of 10 days ( longer is needed ), the dumpster will not prevent you from parking in your own cape coral residential driveway. 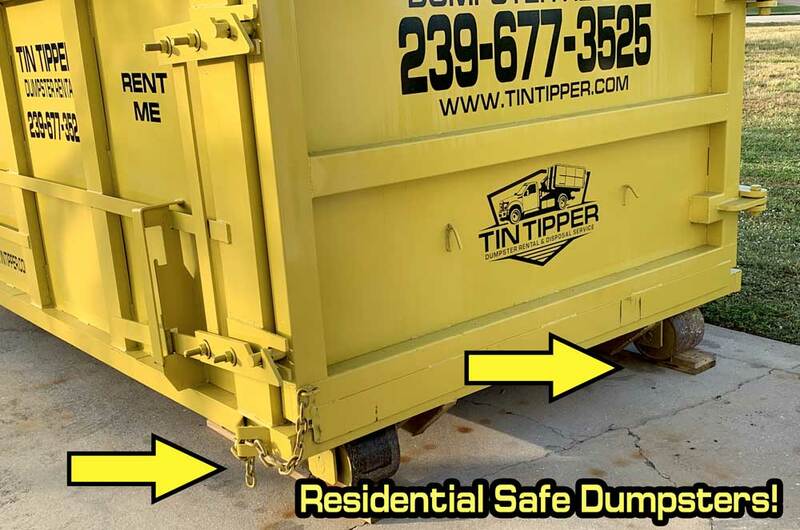 Tin Tipper Dumpster Rental adds another level of protection to your property by placing boards underneath the roll off and front components of our dumpster. By adding this level of protection to your residential property, our delivery and pick up will be performed without causing damage to your driveway. What size dumpster fits in Cape Coral Residential driveways? Our dumpsters will take up half of a 2 car driveway, if your residential property was built with a 1 car driveway, we will push our dumpster as close to your garage door to ensure additional room for your personal vehicles. Our Tin Tipper 11 Cubic Yard Dumpster measurements are 12' long x 7' wide x 4' tall. This dumpster is priced very similarly to our competitors, however, you will gain 1 CY of debris over all of our competitors. Our Tin Tipper 15 Cubic Yard Dumpster measurements are 12' long x 8' wide x 4.' tall. Our Tin Tipper 20 Cubic Yard Dumpster measurements are 12' long x 8' wide x 5.5.' tall. 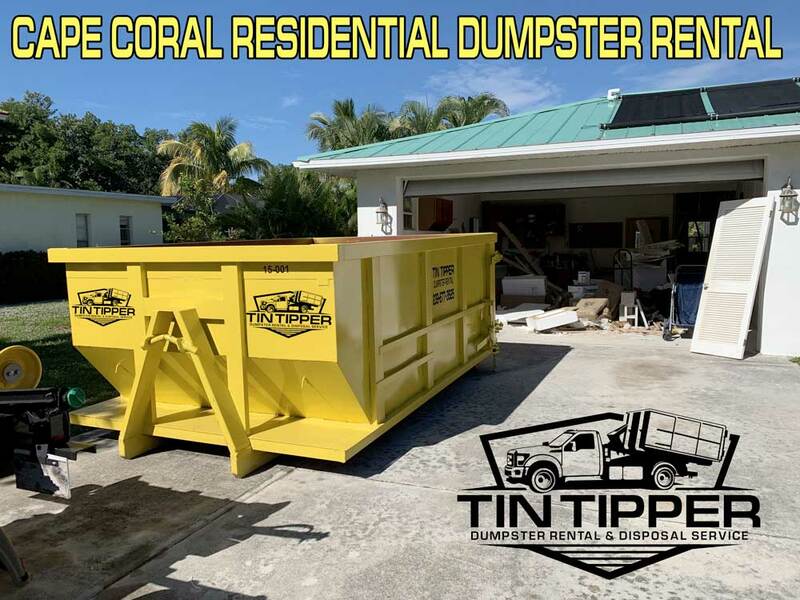 Tin tipper offers our Cape Coral Residential dumpster customers 3 sizes. The 11 cy is $285.00, the 15 cy is $310.00, the 20 cy is $330.00. All of our rentals include delivery and pick up, the rental price includes 10 days, and 1.5 tons to 2 tons of debris. Need your dumpster rental longer! No problem, every additional day will be $10/day. Need more info on our dumpster pricing and sizing information? Everything about our rent a dumpster can be found here! Same day dumpster delivery ? We here at Tin Tipper Dumpster Rental try to accommodate every customer. On many instances, it is possible to deliver your dumpster on the very same day as you called in. Our customers love Tin Tipper Dumpster Rental !